The Opposite House is thrilled to partner yet again with Melbourne based artist Lisa Roet and Asia Link Arts/ Global Art Projects to present Skywalker, an exciting installation this March at The Opposite House. Perched high on the façade of the award winninghotel, Skywalker will be the focal point of a month-long programme of events, discussions andinstallations surrounding bio-sustainability kicking off with Beijing Earth Hour, 24 March. Skywalker will be displayed until 29 April. Inspired by Lisa’s research of newly discovered animal species, predominantly in China’s Yunnan Province, that have been exposed due to deforestation and climatic changes to their habitats, Skywalker explores the themes of community engagement, mainstream environmental debate and a new epoch of discovery while reflecting some of humanities greatest and most difficult challenges. 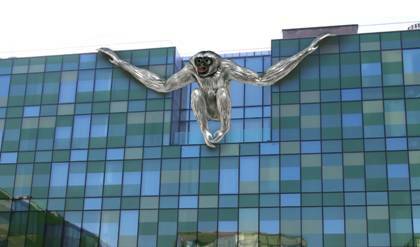 Monkey project presented at The Opposite House in 2016. Beijing’s first environmentally conscious buildings designed by renowned Japanese architect Kengo Kuma, demonstrates Lisa’s passion for challenging yet relevant high impact public projects and her ongoing commitment to research and documentation. committees to create an environmental friendly place for people to live in. grow with the aim of making the world a better and clean place. Skywalker may be viewed from the north façade of The Opposite House from March 18 following its installation.